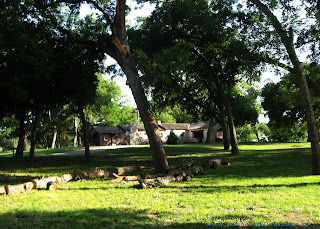 Mother Neff State Park is a small state park in Central Texas. There are tall trees which provide shade on even the hottest days. Many of the structures in the park were built by the Civilian Conservation Corps during the Great Depression. This is a great place to camp, hike, and just unwind from life. Location: 1680 TX-236 Highway Moody, Texas. Moody is approximately 20 miles northwest of Temple and 30 miles southeast of Waco. Cost: $2 for any visitor over age 12. Children under 12 are free. Camping is $12 for sites with water and $25 for full hookups. 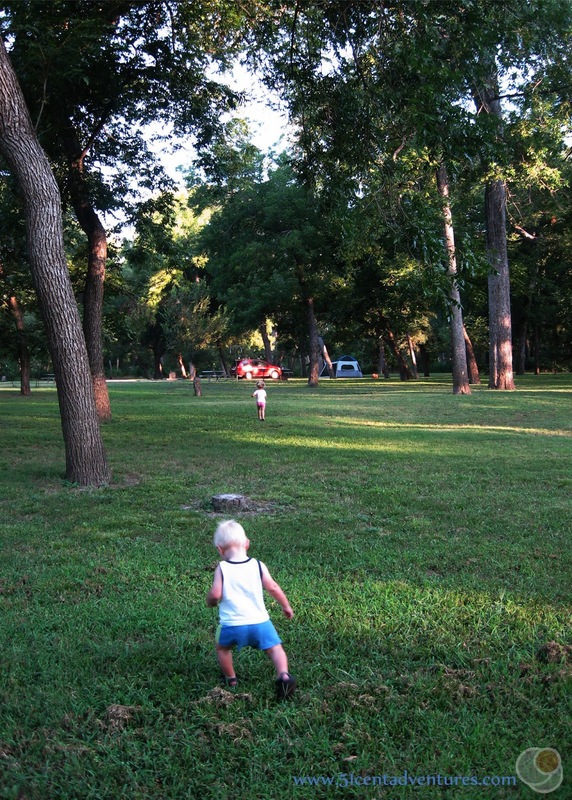 We went on our first camping trip in Texas in April of 2013. We had a fun time, but thanks to my pregnancy, and the infamous Texas heat, we weren't planning on camping again until after the baby was born in the fall. But at the beginning of August my husband mentioned that he would probably have Friday off for a training holiday. He suggested camping as something fun we could do to enjoy the day. I was fine with camping if he was fine doing most of the work. Also we had to find a campsite that fit two criteria. 1. It HAD to have shade, and 2. it was close to Fort Hood- just in case he didn't really get the day off. The kids were really excited at the idea of going camping again. Anytime we talked about it one of my two year olds would ask in a super excited voice, "I go cam-PING now?" We were very impressed by the park. Someone at work had complained to my husband about how expensive camping in Texas was. I don't know what that guy was talking about. We only had to pay $12 to camp here. And unlike the state parks in Utah, we didn't have to pay a reservation fee. We did have to pay the park entrance fee of $2 per adult, but $4 was totally worth it for all this shade. In all we paid $16 dollars and basically had the place to ourselves aside from the people in the RV loop. My husband put up the tent by himself while our two year old twin girls and our 1 year old boy "helped." I was 8 months pregnant so I took it easy. Since it was really hot and humid we didn't bother to put the rain-fly on the tent. My husband had always wanted to sleep with the rain-fly off, but I've never been that brave. This was the very first time I've ever been confident that we wouldn't be surprised by rain. Once the tent was up it was time for my husband to start making dinner. He didn't mind doing all the work. He'd spent a lot of time on overnight Army training exercises that summer and he liked this opportunity to go "real camping." 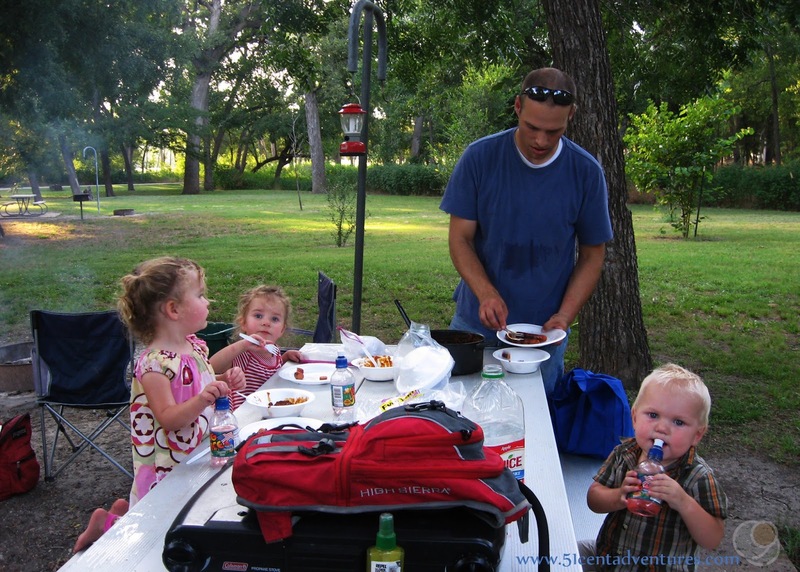 He even cooked the chili and hot dogs over the fire, because he hadn't had a chance to build one lately. 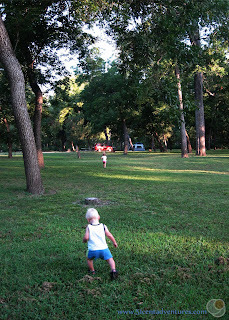 As soon as dinner was over one of the two year olds said, "I ready - go on little walk." So we got everyone ready to hike. 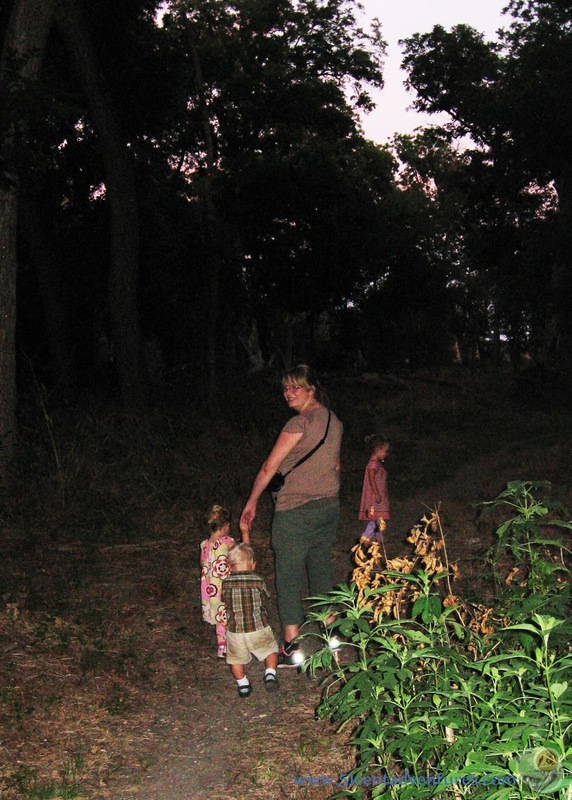 First we had to drive to a trail head - which wasn't that far away, but when you hike with toddlers and a pregnant belly every step counts. And then we had to put shoes and socks on all the kids. Finally we were all out of the car and ready to go. The "hike" was just a walk along a flat trail. The scenery was really pretty. Our kids all reacted to the walk differently. One twin was up front with Daddy and enjoyed the "venture." The one year old walked by himself and inspected everything that he saw. He'd stop for sticks, bugs, rocks, grass, and anything else that was new. The other twin stayed with me and was afraid of everything. She was scared of the dead trees. She was scared of the grasshoppers in the grass next to the trail. And most of all she was scared of a cow that we couldn't even see. We could just hear it mooing in the distance. Husband: Who is ready for another marshmallow? Me: It's a nice cow. 2nd twin (in the exact same tone of voice that my husband and I had used): It's a cow. We still tease my daughter about how scared she was of the cow. Eventually we went in the tent and eventually the kids all fell asleep. I think this was the first time I ever uncovered them from their blankets at night. 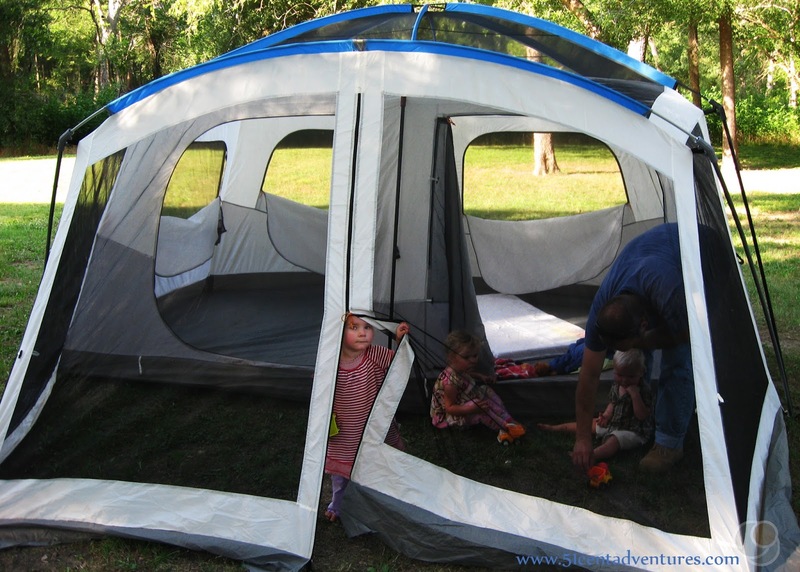 We discovered one of the nice things about camping in hot weather - you don't have to bring much bedding. I knew I would be too hot. Even at home, with the air conditioner and the ceiling fan blowing on me, I was usually too hot to sleep at night. As I predicted I had a really hard time sleeping because of the heat. I'm glad we slept with the rain-fly off because I enjoyed looking at the stars as I just lay on my air mattress. 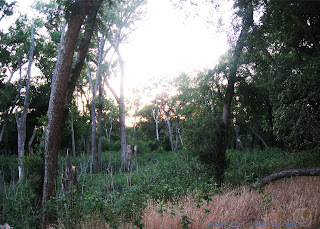 In the morning we went on a little walk to the bathroom, had a breakfast of cold cereal, and packed up the campsite. At that age the kids never did very well while we packed up the campsite. They were always cranky from a lack of sleep or something. As always, we found it was just better to put them in their car seats with the windows down and pack up as fast as possible. The park has many hikes and an observation tower that was built by the Civilian Conservation Corps, but I was pretty much done with being outside in the humidity so we just drove home. 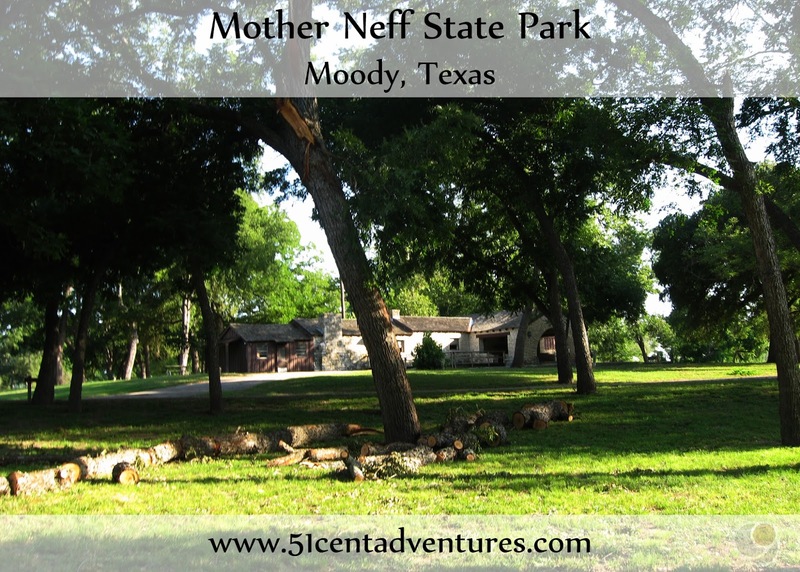 Recommendation: I don't necessarily recommend tent camping at Mother Neff State Park in the middle of the summer - but it is possible if you want to try it. I do recommend visiting this park during cooler months. It's a nice little park with a low entrance fee. Directions: The park is located off of Texas Road 236 which can be reached from Highway 36. Additional Information: The park is named after Isabelle Neff who died in 1921. In her will she donated 6 acres of her land to the state of Texas. Her son, Pat Morris Neff, was the governor of Texas from 1921 to 1925. The land officially became a state park in 1937. You can read about more of the park history here. Places Nearby: Mother Neff State Park is located on the banks of the Leon River. This river is a great place for fishing and water recreation. Read more about it here.